Since Robin Williams passed away I have taken a break from facebook. I have avoided it and the discussions about suicide like the plauge. I am not running from it, I simply just have not been in the mood to discuss it. I have Major Depressive Disorder. For years dr’s have pushed that I had bi polar disoder like my father. However I have pushed back just as hard telling them that they are wrong. I have NEVER hit a mania phase. I have never had that high. I have only ever slid back and forth on the scale from fine/happy to gravely depressed. Recently my life long (15 years almost) bestfriend was diagnosed with depression. It seems hers is likely situational and short term versus mine which is clinical and life long. Nightwish also struggles with depression and bi-polar disorder, which she is getting treatment for soon we hope. My sister has depression, and as I mentioned, My father has Bi-polar. I grew up in a house very educated about mental illness (as it was obviously needed) and very supportive. I know that mental illness is just as real as physical illness. My family is always very supportive of everything that goes with me. I can call my mom or dad in a moment of tearful depression and not have to be chastised for it, but instead have them listen and validate that at THAT moment that is how I feel. So, With all this, wrapping back to the post secret I posted. Do I still feel like that? Yes. Often. I often get weighed down with the facts. I have a life long severe depression disorder. My brain is functionally incorrect. It simply doesnt work right. It is unable to create the hormones it needs to function emotionally as a ‘normal’ brain should. I first became depressed in my early teen years. I was a self injurer all through high school (I since have not cut for 5 years). I have had idyllic dreams of suicide my entire career with depression. How I would do it, when I would do it etc. I have never attempted it, the one time I got close enough to it, I self admitted to the hospital and stayed for a few days. I am on very good medications, that work very well in keeping me happy and healthy. So Why do I still feel like I fight a hopeless battle? I have fought this fight for about 13 years now. I have about another 60 years left. 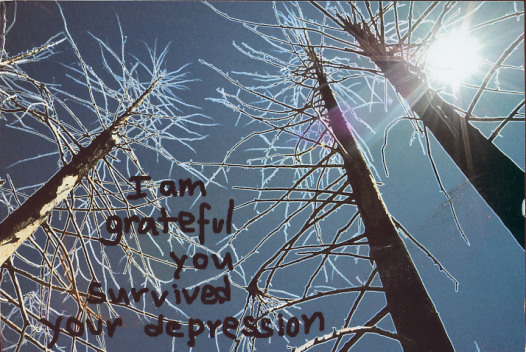 Every day that I wake up, I will fight depression. Every night that I go to bed, I will go to sleep with it there. It wears on me sometimes. Most often, I dont want to kill myself because things are bad. But because I am exsausted. I am tired of trying, fighting and pushing through my depression. It wears me out. It causes physical side effects (IBS) and other mental ones. 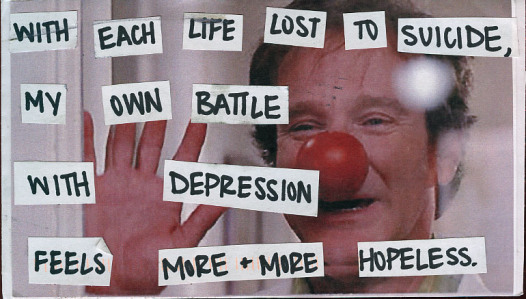 I hurt for Robin Williams and his family. He fought the fight for 63 years. He struggled with addictions, parkinsons recently and finally, depression. He fought a good fight, but in the end, he lost. Cinder often reassures me that he will never let me feel so hopeless that I would feel like killing myself. I smile at that. His intent, is good. His intent, is pure hearted. However, I know the truth of the fight that I fight. I hope that I will be strong enough to fight for another 60 years. That I will forever be able to get back up again and go another roung with this monster called depression. That I will have people like Cinder, Nightwish, Spyder etc in my life to drag me and carry me when I need it. To Those who lost the fight, I commend them for fighting as long as they could. You have touched lives, and people will remember you. As one of your team. As one of you, as part of the body of people fighting, I tip my hat to you in silence and I will carry on another day.